Slewfoot (sitting), Checkpoint Charlie, 2008. Photo by Barry Yeoman. New Orleans lost one of its best-known street musicians with the death this month of 57-year-old Mickey “Slewfoot” McLaughlin. 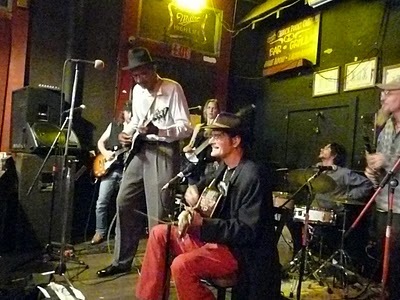 It was a 2008 jam session involving Slewfoot (which you can read about here) that originally inspired our Still Singing the Blues project; his song Raining in New Orleans remains one of our Crescent City touchstones. He was a talented blues guitarist who, according to his obituary, “played so hard and so often on his corner in the French Quarter that some say the pavement still holds his footprints. ” He was a generous champion of other musicians, particularly those like himself who lived on the margins. But it was no secret that Slewfoot was also deeply troubled—a survivor of heroin addiction, not to mention major medical problems like heart disease. Folks in our hometown of Durham, N.C. might also remember Slewfoot as a DJ on WXDU. There will be a memorial for Slewfoot Wednesday at 6 p.m. at St. Anna’s, 1313 Esplanade Ave. in New Orleans. It will be followed by a secondline to the Apple Barrel Lounge on Frenchman Street, where Slewfoot used to play.